The researchers found that the high-risk variant, ApoE4, triggers an inflammatory reaction that weakens the blood-brain barrier, a network of cells and other components that lines brain's brain vessels. Normally, this barrier allows nutrients into the brain and keeps harmful substances out. "The study demonstrates that damage to the brain's vascular system may play a key role in Alzheimer's disease, and highlights growing recognition of potential links between stroke and Alzheimer's-type dementia," said Roderick Corriveau, Ph.D., a program director at NIH's National Institute of Neurological Disorders and Stroke (NINDS), which helped fund the research. "It also suggests that we might be able to decrease the risk of Alzheimer's disease among ApoE4 carriers by improving their vascular health." Common variants of the ApoE gene are strongly associated with the risk of developing late-onset Alzheimer's disease, but the gene's role in the disease has been unclear. Now, researchers funded by the National Institutes of Health have found that in mice, having the most risky variant of ApoE damages the blood vessels that feed the brain. The study appears today in Nature, and was led by Berislav Zlokovic, M.D., Ph.D., director of the Center for Neurodegeneration and Regeneration at the Zilkha Neurogenetic Institute, Keck School of Medicine, University of Southern California, Los Angeles. "Understanding the role of ApoE4 in Alzheimer's disease may be one of the most important avenues to a new therapy," Dr. Zlokovic said. "Our study shows that ApoE4 triggers a cascade of events that damages the brain's vascular system," he said, referring to the system of blood vessels that supply the brain. The ApoE gene encodes a protein that helps regulate the levels and distribution of cholesterol and other lipids in the body. The gene exists in three varieties. ApoE2 is thought to play a protective role against both Alzheimer's and heart disease, ApoE3 is believed to be neutral, and ApoE4 confers a higher risk for both conditions. Outside the brain, the ApoE4 protein appears to be less effective than other versions at clearing away cholesterol; however, inside the brain, exactly how ApoE4 contributes to Alzheimer's disease has been a mystery. Dr. Zlokovic and his team studied several lines of genetically engineered mice, including one that lacks the ApoE gene and three other lines that produce only human ApoE2, ApoE3 or ApoE4. Mice normally have only a single version of ApoE. 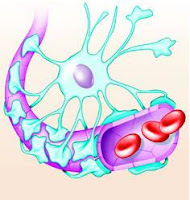 The researchers found that mice whose bodies made only ApoE4, or made no ApoE at all, had a leaky blood-brain barrier. With the barrier compromised, harmful proteins in the blood made their way into the mice's brains, and after several weeks, the researchers were able to detect loss of small blood vessels, changes in brain function, and a loss of connections between brain cells. The researchers also found that ApoE2 and ApoE3 help control the levels of an inflammatory molecule called cyclophilin A (CypA), but ApoE4 does not. Levels of CypA were raised about five-fold in blood vessels of mice that produce only ApoE4. The excess CypA then activated an enzyme, called MMP-9, which destroys protein components of the blood-brain barrier. Treatment with the immunosuppressant drug cyclosporine A, which inhibits CypA, preserved the integrity of the blood-brain barrier and lessened damage to the brain. An inhibitor of the MMP-9 enzyme had similar beneficial effects. In prior studies, inhibitors of this enzyme have been shown to reduce brain damage after stroke in animal models. "These findings point to cyclophilin A as a potential new drug target for Alzheimer's disease," said Suzana Petanceska, Ph.D., a program director at NIH's National Institute on Aging (NIA), which also funded Dr. Zlokovic's study. "Many population studies have shown an association between vascular risk factors in mid-life, such as high blood pressure and diabetes, and the risk for Alzheimer's in late-life. We need more research aimed at deepening our understanding of the mechanisms involved and to test whether treatments that reduce vascular risk factors may be helpful against Alzheimer's." Alzheimer's disease is the most common cause of dementia in older adults, and affects more than 5 million Americans. A hallmark of the disease is a toxic protein fragment called beta-amyloid that accumulates in clumps, or plaques, within the brain. Gene variations that cause higher levels of beta-amyloid are associated with a rare type of Alzheimer's that appears early in life, between age 30 and 60. However, it is the ApoE4 gene variant that is most strongly tied to the more common, late-onset type of Alzheimer's disease. Inheriting a single copy of ApoE4 from a parent increases the risk of Alzheimer's disease by about three-fold. Inheriting two copies, one from each parent, increases the risk by about 12-fold. Dr. Zlokovic's study and others point to a complex interplay between beta-amyloid and ApoE4. On the one hand, beta-amyloid is known to build up in and damage blood vessels and cause bleeding into the brain. On the other hand, Dr. Zlokovic's data suggest that ApoE4 can damage the vascular system independently of beta-amyloid. He theorizes that this damage makes it harder to clear beta-amyloid from the brain. Some therapies under investigation for Alzheimer's focus on destroying amyloid plaques, but therapies designed to compensate for ApoE4 might help prevent the plaques from forming, he said. This research was funded by grant NS034467 from NINDS, and grants AG023084, AG039452 and AG013956 from NIA. Reference: Bell RD et al. "Apolipoprotein E controls cerebrovascular integrity via cyclophilin A." Nature, published online May 16, 2012. NINDS (http://www.ninds.nih.gov) is the nation's leading funder of research on the brain and nervous system. The NINDS mission is to reduce the burden of neurological disease – a burden borne by every age group, by every segment of society, by people all over the world. NIA (http://www.nia.nih.gov) leads the federal government effort conducting and supporting research on aging and the health and well-being of older people. NIA provides information on age-related cognitive change and neurodegenerative disease specifically at its Alzheimer's Disease Education and Referral (ADEAR) Center at http://www.nia.nih.gov/Alzheimers.